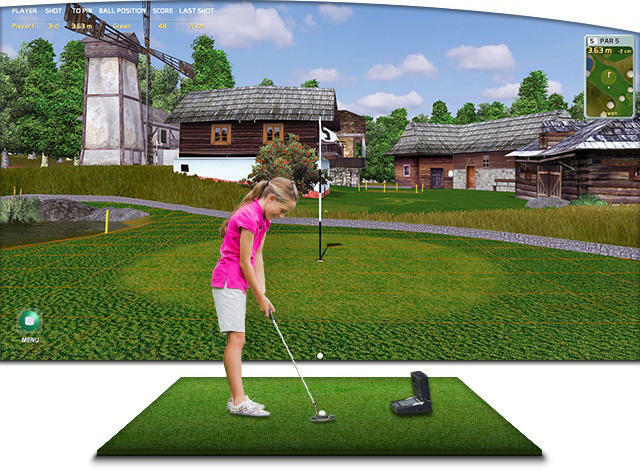 Creative Golf 3D - version 2.3. What innovations does the ‘Creative Golf 3D Version 2.3’ update bring and why should you install it? Note: update of your software will retain your courses, individual settings and saved games. You should install the update if your current version is older (lower number) than version 2.3. You can find out your current version in the lower left corner of the main menu. CG3D version 2.3 allows you to play popular competitions, such as Target Golf and Demolition Golf not only as a contest on mass events, but also as an ‘individual’ game on various targets or locations, i.e. it allows you to play in a similar way as on several holes on a course. This not only improves your shooting skills at different distances, but will also add new entertaining and competitive element to the game. We improved the Menu structure - new types of games are located in the ‘Games’ section, the competitions remain unchanged (‘Competitions’ section). Individual shots can be evaluated and compared according to individual players by using the Team Training option. Club Fitting allows to see the training results according to individual clubs, which can help with club comparison for the purposes of selecting or purchasing the club of your choice. Putting is improved with a new feature – possibility to rotate the scene view of the green to the direction of an ideal putt, which allows beginners to concentrate only on the strength of the putt. Direct shot increases the possibility of hitting the hole. Better crisis management (power outage) – autosave also for driving range, etc. Improved behavior of the ball when hitting fairway, green, etc.